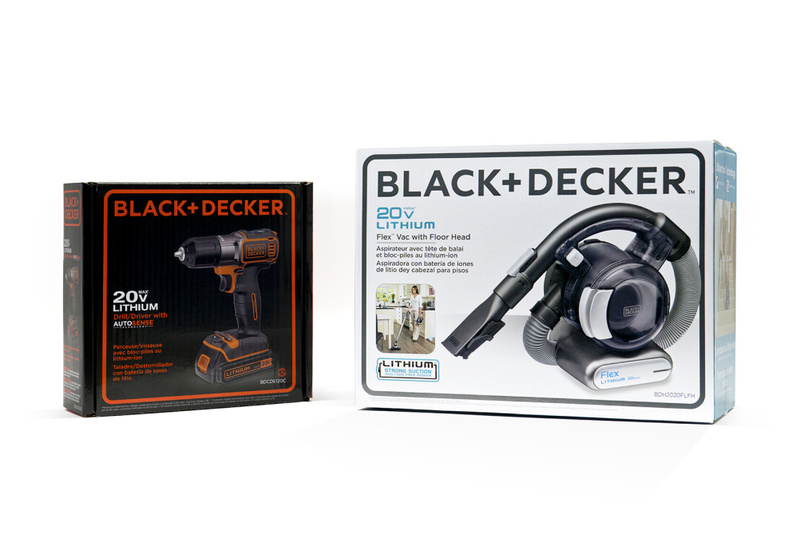 Power tool brand Black & Decker is rebranding to become Black + Decker. The new identity, which is set to roll out internationally, has been developed by Lippincott. Lippincott was appointed to the work last year, having previously rebranded Black + Decker sister brand Stanley. The consultancy says it aimed to focus on ‘less design – to ensure everything from the logo, to the packaging and even the hand vacs and power tools had less decoration and focused on the substance of the actual products’. It also wanted to create a brand that was ‘versatile enough to shape a cohesive end-to-end customer journey’. The new identity sees the logo colour palette reduced to just black and orange, while a plus sign replaces the previous ampersand. Lippincott says the identity is designed to be ‘simple, clean and powerful’. A rounded holding aims to evoke previous Black + Decker product plaques. Packaging and product branding has also been simplified to use the two-colour system. Lippincott says it worked with Black + Decker employees, customers and other stakeholders to develop the brand proposition, which is based around ‘powering people’. Black + Decker says it will build on the rebrand with new products and marketing campaigns that will aim to further modernise the brand. Looks own label, cheap and fake. They have lost the only ownable part of there logo, the hexagon. I fear for this brand shelf life in the market. I completely agree with Mr Rex. This new branding evokes that of a “value range” making it appear cheap. The new one… Wouldn’t go near it for fear of a flimsy inferior product. I’m looking forward to seeing how the brand progresses though, I may be proven wrong but for now… If it ain’t broke. Actually I like it. The name is the brand – and it’s a very strong name. If Lippincott’s aim is to focus on the products and not design and decoration, I think they’ve achieved that. And I personally don’t see the shelf life suffering because of it. Wow!, thats not what I would have expected from Black & Decker, one of the strongest brand names in the DIY market now has an infinitely forgettable brand logo… I just don’t get it, and the phrase ‘versatile enough to shape a cohesive end-to-end customer journey’., seems straight out of the marketing graduates handbook. Get back to solid design, recognisable, unique, something you can verbalise and something that’s frankly better than this. Limpincotts work with Stanley was to be commended for its iconic confidence and ability to push the brand forward. This is without doubt a departure from that ethos. To flippantly dismiss this as ‘own-brand’ or ‘like a student project’ would normally seem harsh but I’m afraid that Mr Rex and Jordan Hemsworth comments above are spot-on. Sadly, It now looks fake and has lost that confident, robustness that the previous design had. More of a cheap Chinese knock-off than a home DIY professional’s choice. I understand the strategic reasons behind this new direction but above all the execution is poor too. Forgettable and drab. Sorry Lippincott, it’s not powering these people. ‘powerful’, powering people’, ‘feeling of accomplishment’, ‘versatile’, ‘a feeling of accomplishment’. Are clients still absorbing this **** whilst signing the cheques?! The logo has definately lost it’s ‘strength’. It also looks dated – keeping the font white might have helped. It’s sad that designers seem to be blinded by the ‘flat’ and ‘thin’ trend. That B&D still commands a lot of residual affection from many people is perhaps their one strongest asset. It is a brand that people want the chance to buy into. Having done up quite a few houses over the last 10 years I have always secretly hoped to find Black and Decker back up there – a proud contender, with product style, robust quality and some of that essential powertool swagger that might make me pick them out from the busy competiion. One look at this flimsy nothing sends me careering in the opposite direction, assuming that they had now accepted their downfall as absolute, and and moved to position themselves as competing against the no-designs, ownbrands and cakedrills instead of the major players in construction. Maybe they are, maybe this is the new niche they have spotted, if so well done, I guess. To be frank their products just are not perceived as that superior that they can afford to play the pseudo-humility game and push their name to the background. This looks badly like a design conceit to the detriment of their client. It must have taken all of a morning. Shame. The new marque does not offer the “stamp” of authority that the old one did. The logotype is not as self assured or robust as it needs to be. And the “+” doesn’t really add any value overall. In my opinion, this evolution is too far a departure for the brand. I just can’t see it serving Black & Decker for the long-term. For something “less designed” it’s actually pretty well done. Although I’m not really a fan of the + sign. The name is their brand so I don’t really agree with most of the comments here. It’s a mark that goes along with what they wanted. It’s simplified. I honestly had no idea what the logomark for their company was. I only know the name. I have to admit though that the bright white logotype was instantly recognizable. I will never not laugh at a design agency’s press release. It’s possible they’ve looked at the simplicity of the Bosch logo as a starting point, but Black and Decker don’t have the same market presence or reputation to carry it off. Understated works with higher end goods with a great track record, but even in this sector brands like DeWalt or Makita go for something robust or memorably quirky. Black and Decker is aimed at the amateur DIY market where a strong identity is needed to stand out amid the competition, what they’ve come up with is neither unique, memorable or distinctive. A refinement of the previous logo would have worked well, like the recent Argos refresh. Replacing the & with a symbol representing ‘first aid’. Not sure what this suggests in the power tools market. Dough! !